Last night was great. 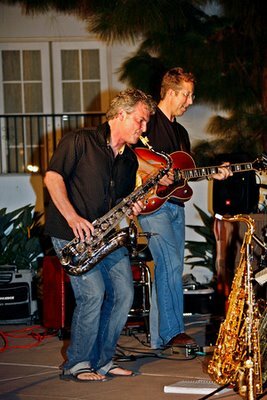 I went to see my friend and colleague Brad Rambur play jazz saxophone with his band at the Blue Fire Grill of La Costa Resort. His keyboardist played with Ike Turner, and the bassist was a session musician with the Beach Boys. They were really, really good. And the venue was spectacularly gorgeous. Their contract has them playing Friday and Sat night until the end of the year, so I plan to go back often. I saw an apartment today that I really like… I hope it works out. Literally, it is steps from Encinitas’ Moonlight beach and it is very modern: travertine floors and granite countertops. It’s basically the guest house off of a main house… a little Fonzi quarters beside one of the many San Diego McMansions. I hope that my certainty and boldness pays off in this scenario. My good credit score may come in handy too! I finally saw Dark Knight last night. It was decent, but a little long. It seems to me that the main message of that movie that the good guys need to be willing to endure situations where other people talk sh*t about them? Why is it that the American public needs that message now, and/or is willing to accept this message? As an adult, I’ve settled into the pattern of being the last of the first wave. I let the very early adopters effectively beta-test all the new products and services. They pay more for the privelege of being the cool kids on the block, which makes the producers happy. They are also helpful in that they give constructive criticism about defects to the product development staff. Companies respond by releasing patches, and they incorporate those fixes in the next generation of the product. The cycle of product development continues. A few months ago, I bought an iPhone. Everyone said: “Why not just wait till the new one comes out?” Due to mostly personal timing issues, that wouldn’t have worked for me… but I also know that even the coolest manufacturers put out buggy products when they go in a new direction, and I was secretly glad that I could be the last of the early adopters. Fast forward to vindication. This article describes problems with the 3G iPhone. Maybe it’s the network, maybe it’s the chipset… whatever. There are a lot of people complaining and I am glad that I’m not part of that group. I’m totally happy with my purchase, which is the last of the first generation of the iPhone. The San Diego freeways are noticably less crowded than a year ago. Since I’ve been back, I have driven at different times of the day (during rush hours, during lunch) and on different freeways (5, 15, 52, 56, 78) and haven’t run into congestion anywhere. At first, I thought that I just may be getting lucky. Then I thought that maybe I just hadn’t remembered traffic patterns correctly. But now I’m convinced that high gas prices have forced different driving habits among the lower class and much of the middle class. That said, the evidence I use to support my claim is purely anecdotal, not scientific. So maybe I’m wrong, but I also assess that there are mostly high-end (more expensive) cars on the road. Could it be that only the wealthy people can afford to drive in SoCal with +4 dollars-a-gallon gas? Regardless, I’m ok with it. MiniLee got 32mpg at 75mph average all the way down from Seattle. Those results aren’t as good as a TDI or hybrid, but it’s not too shabby either! I am now in San Diego. Ahhhh….. happiness returns. Defcon was good. I was just there for a few hours on Sat night and Sunday morning, but I had a good time at the IO Active-sponsored party, which was a Freakshow circus theme. And yes, since so many of my readers sent me snarky, quizzical emails on the topic… I will concede that it is a male-dominated uber-geek-fest. But that’s why it is awesome! Really. If you’ve never partied with geeks, you probably have no idea what I mean. I have partied with both “cool kids” and geeks and I think the geeks are almost always more fun when there is a large group and a lot of alcohol. There’s just less self consciousness with the geeks. I don’t mean to perpetuate stereotypes, but it seems to me that rather than the alcohol having the effect of inducing fighting and agression (as it does with the jocks) it tends to induce dancing in the geeks. I would have liked to have seen more of the presentations… I caught a few minutes of some of the talks on Sunday, but I didn’t have a badge so things were a little difficult. Most of the presentations were completely above my head from a technical perspective, but I grasped some and would be interested in learning more. I’ve left Seattle and am publishing this post from Boise, Idaho. I’m glad to be gone… not to belabor the point, but the weather was killing me. Even the last couple of days in Seattle (Aug 1 – were chilly… I was wearing a jacket almost every day. In August folks, August in the Northern hemisphere is supposed to be hot. Look, I know that everyone is getting sick of me complaining about the weather, so I promise not to do that soon. I probably won’t even notice the weather in San Diego after a month or so of blissing-out about the difference between SD and SEA. One more thing about my moving away from Seattle: I was surprised about how many friends I made, and how quickly. Most were nascent friendships, but I plan to keep in touch with a few people. They’re great people… maybe we can visit each other sometime. Or maybe I can be the cruise director for San Diego (Kelli was mine for SEA) and get them to relocate. This is my last week in Seattle. I had some fun this past weekend… tying up some loose ends and whatnot. I am also in conversations about my new life in San Diego. Although I am working with my current employer for the next two months, it is a transition and will come to an end. Consequently, I am in conversations about new jobs and I am excited about one opportunity in particular. More information will come later, if it all turns out. There’s so much going on right now that I can hardly put it all into coherent thoughts, let alone logical sentences on a blog. You are currently browsing the Lura.net Blog archives for August, 2008.